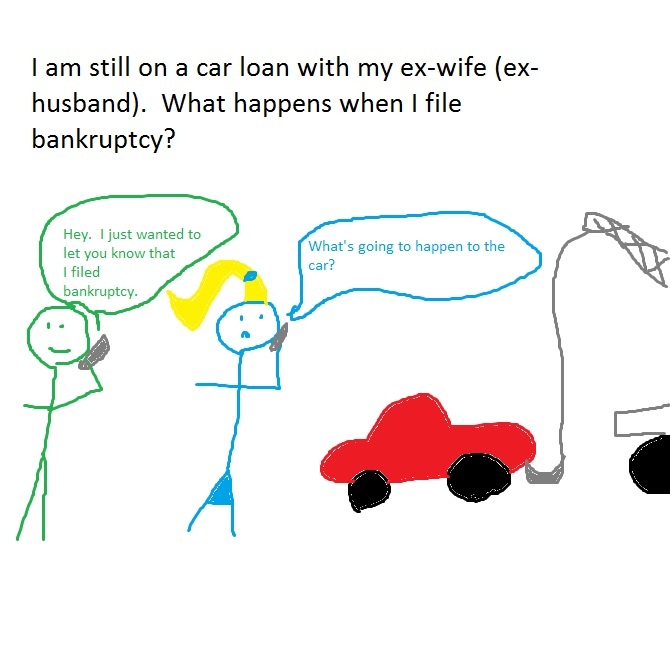 I am still on a car loan with my ex-wife (ex-husband). What happens when I file bankruptcy? It depends on what you want to happen. Most likely, we will take you off of the car loan and discharge that debt. Your ex-spouse is still on the hook for the full loan, and they will need to keep paying it or face repossession. When we file a chapter 7 bankruptcy, we check a box that states whether we want to surrender a secured loan (like a car loan) or reaffirm and keep it. With you own car, it is normal to check the box to reaffirm the debt and keep making payments on it. With an ex-spouse, it is a bad idea to reaffirm that debt. You should simply wipe out your liability on it and move on. If they want to keep the vehicle, they’ll have to keep paying on it. Now there are always exceptions. Let’s say that as part of the divorce decree, you were ordered to keep up payments on her minivan, then maybe you should reaffirm it. Or maybe you’re the only name on the loan, you still have a good relationship with her, and she is good at making the payments. You can still reaffirm and keep it (although most attorneys don’t like you to reaffirm on anything). But generally, we list it and wipe it out. In a chapter 13, it’s just about the same. If you want to surrender your liability on the loan, you can do so. If she wants to keep it, she’ll need to keep paying for it. If you want to keep the loan yourself and keep paying on it, it may be a little more tricky. The chapter 13 trustee will want a very good reason for you to keep this secured debt for something you don’t even drive. Now I often get asked if you can list the loan in your bankruptcy and have your ex-spouse assume the loan with the bank. This is a matter between them and the bank. I have never actually seen it work, since divorce wrecks your finances and credit (and hers too). It is possible, but very unlikely. This entry was posted in Utah Bankruptcy on November 16, 2017 by robertspaynelaw. 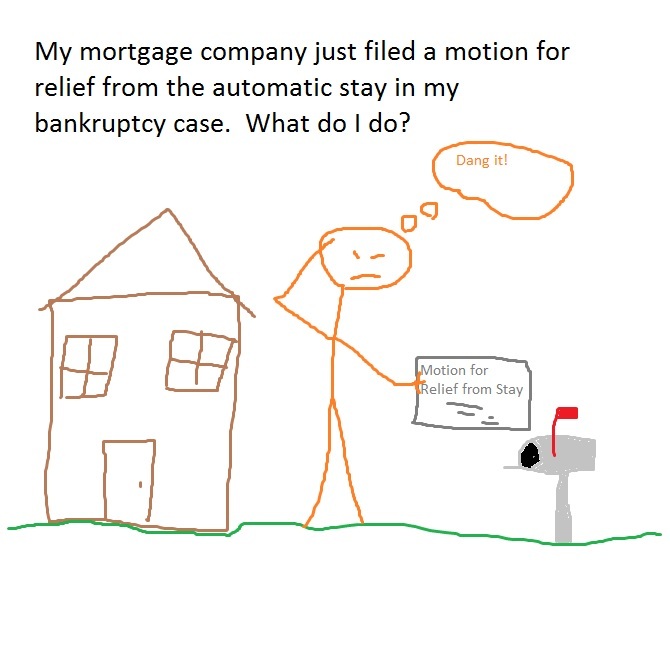 My mortgage company just filed a motion for relief from the automatic stay in my bankruptcy case. What do I do? It depends on whether you want to keep the home or give it up. Fight it if you want to try to save the home. Ignore it if you’re surrendering the home anyways. So when you file bankruptcy, the Bankruptcy Court imposes something called the automatic stay that stays (stops) creditor actions like garnishment, foreclosure, and repossession. 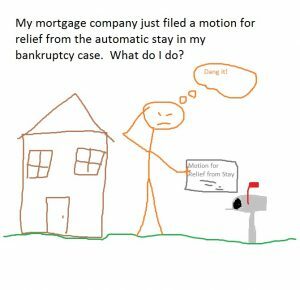 If the creditor wants to remove that protection, they file a Motion for Relief from Stay (“MFRS”), asking the court to remove the stay so that they can foreclose (or repossess). If you were planning on surrendering the home anyways, then you can ignore it. They’ll lift the automatic stay, eventually foreclose on the home, and you will no longer have it in your possession. But since you filed bk first, they CANNOT come after you for the deficiency in most cases, and they CANNOT report it on your credit as a foreclosure. If you do nothing, the home and creditor will go away, and you will suffer no further negative credit or collection repercussions. Now if you want to keep the home, that’s different story. You can object to the motion, but you usually need to throw money at them to make it go away. If you are three months behind on mortgage payments since filing your bk, then you’ll either need to catch up in one lump sum and start making regular mortgage payments again, or you’ll need to get on a repayment plan plus start making regular mortgage payments again. If you cannot, then they will win the motion, and you’ll lose the home. You could object and say that you are trying for a loan modification, but unless you have the loan mod in place, this really isn’t a valid objection. You can also object and say that they are wrong on their calculations, but I’ve only seen a handful of cases where the debtor was correct and the mortgage company was grossly off. It all comes down to money. If you can throw enough money at them, they will go away. Trust Deed. Copies of the Note, Trust Deed, and Assignment of Trust Deed are attached hereto. September 1, 2017 to November 1, 2017.
its interest in the property. 4. That Debtors have no realizable equity in the property. Secured Creditor may proceed to pursue its rights and remedies under applicable law. expenses for bringing this motion in accordance with its note and trust deed. of any order for relief granted herein. Creditor or has been duly endorsed. debtors via telephone or written correspondence to offer such an agreement. This entry was posted in Utah Bankruptcy on November 15, 2017 by robertspaynelaw. 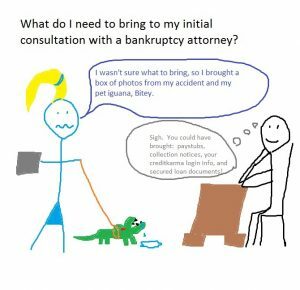 What do I need to bring to my initial consultation with a bankruptcy attorney? Honestly, nothing. 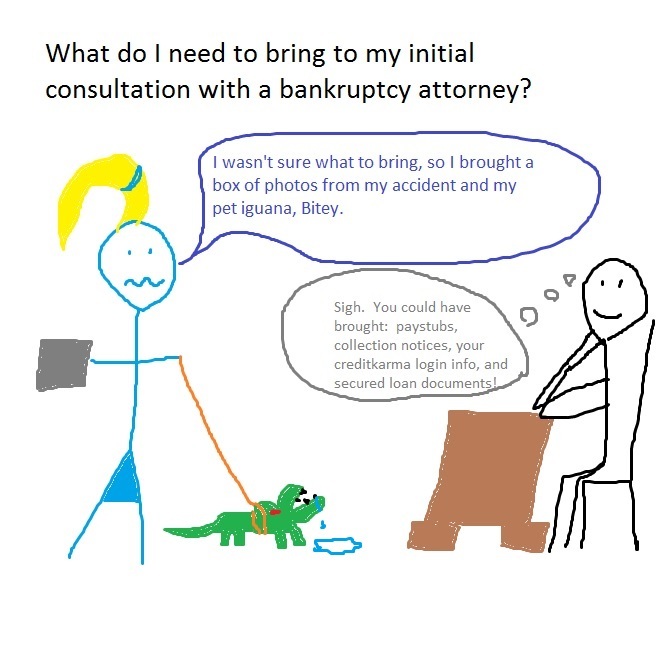 Most of my clients don’t bring any documents to their first consultation, but it wouldn’t hurt to be a little prepared. Here’s what you don’t need: money. I hate taking money at the first meeting, because I want you to go home and really, really think about it. Yes, I know that you’ve been thinking about it for at least 6 months or more before you call me, but one more night won’t hurt. You also don’t need money to pay for the initial consultation. It’s free. paystubs — Sometimes, the main factor determining whether you can file a Chapter 7 or a Chapter 13 is your income. If you make too much, you might be looking at a repayment plan. If you bring your paystubs, we can calculate your 6 month averages to see where you fall. collection notices — This will give the attorney a good idea of where you are in the collection process. If you’re still getting nasty letters saying that they will send you to their legal department, there is not a real rush for time. If you have garnishment paperwork from your employer, then we need to file this case by Wednesday so that I can notify payroll to stop that Friday garnishment. If you have a foreclosure notice for next Tuesday, then we’d better do something by Monday to save the home. credit report — Maybe. If you have set up an account at www.creditkarma.com, you do NOT need to print it out, but make sure to log in to your account at the office so that the attorney can save a .pdf copy of your report. taxes — not really necessary, but I’d love to see how large your tax refund was last year. You’ll eventually need them before you file, but they don’t make a huge difference for the first consultation. online class (Credit Counseling) — no. You don’t need to do this before you meet with your attorney. secured loan documents — Yes please. Mortgage statements and car loan balances will make a huge difference on determining the value of your assets. So if you want to be extra-prepared, then bring paystubs, collection notices, your creditkarma login info, and secured loan documents, and you’re good to go. This entry was posted in Utah Bankruptcy on November 14, 2017 by robertspaynelaw. This entry was posted in Utah Bankruptcy on November 6, 2017 by robertspaynelaw. 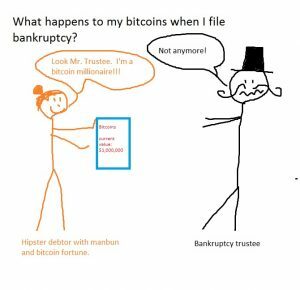 What happens to my bitcoins when I file bankruptcy? In bankruptcy, we list all of your assets and then exempt (protect) them. Most assets, like $3,000 of equity in your car, or 100% of your 401k, or all of your clothing on your back are protected under state or federal bankruptcy exemptions. However, some assets are not protected. For example, here in Utah, you can protect 3 firearms. So if your have 4 shotguns, then one of them is not protected, and there is a chance that the bankruptcy trustee will want to liquidate it (sell it) and use the proceeds to pay your creditors. Bitcoins are a kind of investment, but not one protected under our exemptions. So let’s say that you bought 3 bitcoins a couple of years back for $1,000. Now they’re just sitting in your bitcoin wallet somewhere in the internet ether. When we list your assets prior to filing bankruptcy, we will have to list those at their current fair market value. As of today, it looks like bitcoins are selling for about $7,000 u.s.d. (See https://www.coindesk.com/price/ ). In other words, your internet bitcoins could sell today for 3 x 7,000 = $21,000. When we file bankruptcy, the bk trustee will most likely ask you to liquidate those, give him the proceeds, and he’ll use them to pay off your creditors. Now that’s in a chapter 7. If you file a chapter 13, the bk trustee won’t make you sell them, but he’ll demand that you pay at least $21,000 back to your unsecured creditors over a 5 year chapter 13 plan. Either way, you lost the value of those bitcoins to your creditors. You might think that there is no way for the bk trustee to track your bitcoin ownership, and you may be right. However, the truth has a funny way of coming out. Angry exes will always pop up at the wrong time. The bk trustee may be looking at your bank statements and ask you what that $100 transaction was at www.coinbase.com last month when you decided to dabble in ethereum and litecoins. There is always an electronic or paper trail. Besides, you really should be honest because it’s just not worth the fraud charges and denial of your bk discharge. 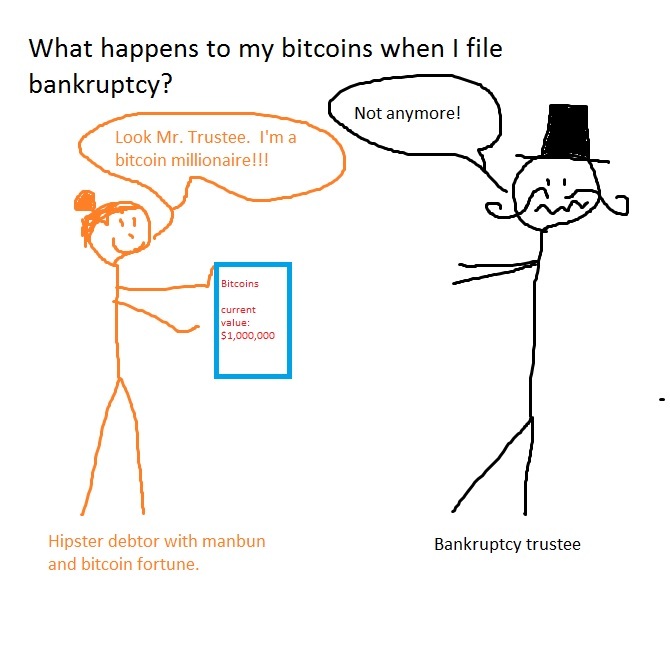 So in essence, if your bitcoins have any value on the date of filing your bankruptcy, then you will probably lose them.